After rectifying the topology issue with the front apron, all of the pieces were in place to assemble. Of course, there were a few more details which had to be addressed after this picture was taken, but you get the idea. 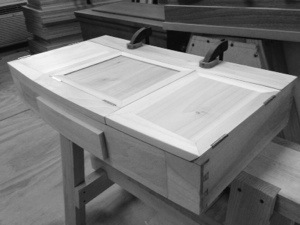 With the main box together, attention turned to the lids covering the compartments. 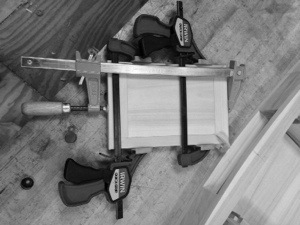 The components for these were held against the main box, and marked to length accordingly. 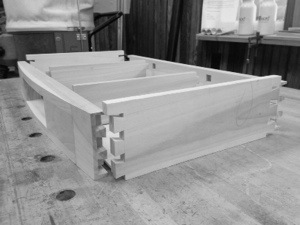 Once assembled, they were profiled to match the contours of the main box front, and back. 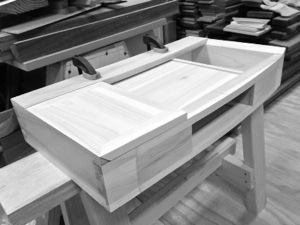 Mortises for the hardware provided by David Sapp of Woodcraft of Franklin, TN were created. 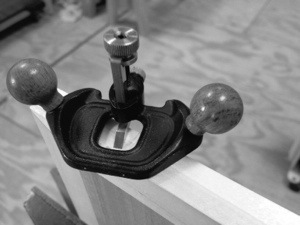 I finally got to use my mini-router plane. Isn’t it cute! 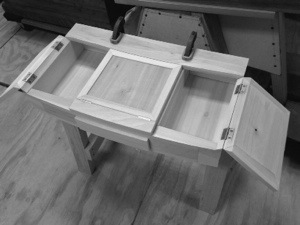 It took several attempts to determine the proper fasteners for the compartment lids. 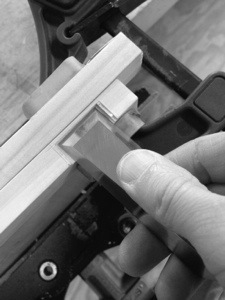 The areas where the hinges were installed were beveled which means there really wasn’t much material for mounting. If the screws were too long, they protruded from the “Main Box” side, and would interfere with the opening, and closing of the table!